I had an excellent few days at the remarkable War & Peace show last week. It’s always a good place to catch up with friends interested in Military History and also pick up some images for the archives from some of the many military stalls at the show. 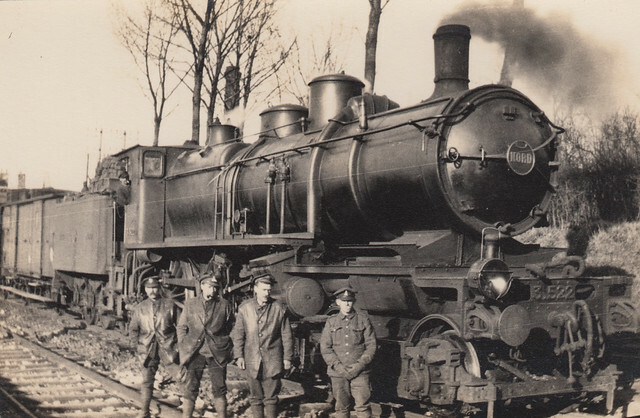 This was one of my finds last week; a nice photograph of men of the Railway Operating Division of the Royal Engineers operating a steam train on the Somme in March 1918. The caption on the reverse indicates this train was being used to evacuate French civilians feeling from the German advance on the Somme at that time. Civilians running from a German attack is something we more associate with WW2, but it happened many times in WW1 as well, especially in the spring of 1918 as the German Army almost broke through on several parts of the Western Front. Great War Photos shuts down for the summer now; it’s been an amazing year with more than 70,000 unique visitors since we started in January. Thanks for all your support and see you in the autumn! This entry was posted on 24/07/2012 by sommecourt. It was filed under Battlefields, British Army, France, French Front, Great War, Somme, Western Front, WW1 and was tagged with 1918, Picardy, Royal Engineers, Somme, Steam Train, Train, Western Front, WW1. Many Thanks Paul for the great posts, hope you and the family have a well deserved break.